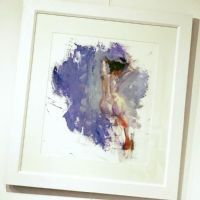 Living and working in Belfast, Peter graduated from the University of Ulster with BA Hons in Fine Art in 1997 and has been painting ever since. He has completed numerous portrait commissions including Radio Ulster presenters Steven Rainey and Marcus Hunter-Neill and Ulster/Ireland rugby player Ian Henderson. He recently had a piece accepted into the Royal Ulster Academy’s 136th exhibition.